Firstly, Happy New Year. I hope last year was good and this year will be even better. My year has been amazing for reasons entirely unconnected with cycling. I’m going to wait here until Dad gets back from Base Club. OMFG Dad, I’m so tired just watching this hill climb. 4. Insist your inlaws move to a location approximately 50-70 miles away on the other side of an escarpment of hills; visit them regularly en famille: cycle there. In line with point 4, I cycled to the inlaws at the weekend. In these enlightened times where everyone’s a cyclist and everyone has an opinion about cycling, people are less and less surprised by the strange endeavours of the long distance wheelman. I rode to Cheltenham from Bristol, a 65 mile jaunt over the old Severn Bridge and via the Forest of Dean. I dropped this into a pub conversation and it caused a murmur of disbelief. ‘You did what? CHEPSTOW? You’ve been to Wales? ANOTHER COUNTRY?’ I felt vaguely nostalgic for the days when every Monday was marked by similar conversations as non-cyclists attempted to suspend their disbelief at my heroic exploits around lanes of Kent. Maybe it was a peculiarly atavistic weekend, after all, I saw only two other cyclists in the four hours in the road and I traversed the Forest of Dean where the locals eat their young. in the five years since moving to Bristol and 30,000 miles or so ridden I’d not made it over the bridge by bike until yesterday. Belle managed this feat some years ago. I ignored my normal Cotswold lungbuster in an attempt to squeeze in a few more miles. Riding over the bridge is fun. It opened in 1966, which isn’t all at long ago. I imagine it was heralded as a new economic dawn and anglo-welsh success story, destined to link the two shorelines in perpetuity. Instead, traffic tripled in 20 years and a new bridge was completed in 1996. 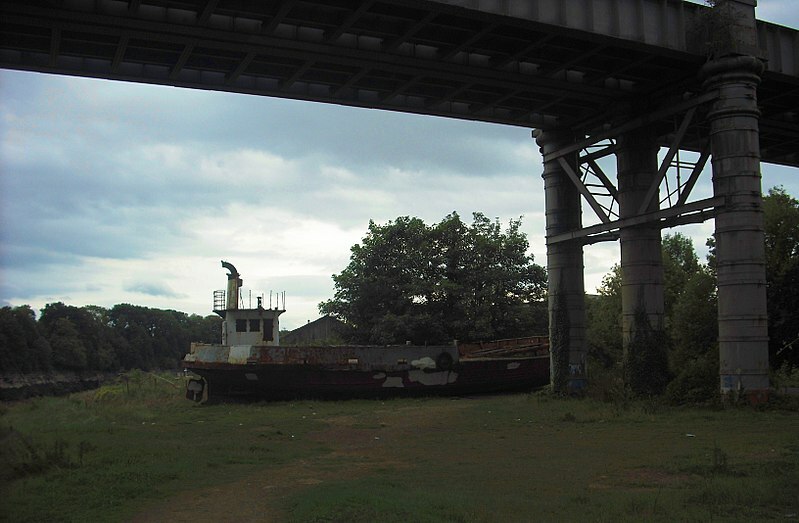 I wonder how long it will be before another bridge is mooted as the solution to ever-increasing numbers of vehicles. 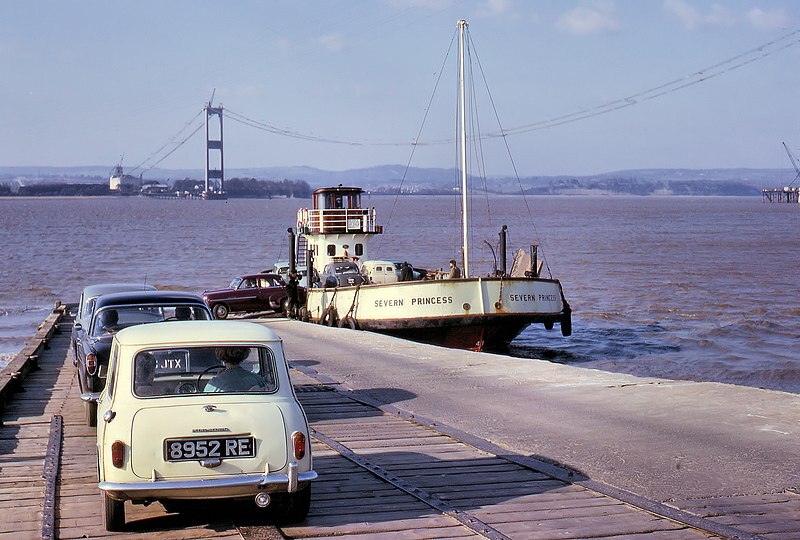 Before the bridge there was only a ferry at Aust. Some of the signage is still there and the crossing is marked by Passage Road. The climb up and out of Chepstow is terrific. It heads upwards for around 4 miles or so, then the road sinuously reaches up towards the Forest of Dean. Come the high season I’d like to get fresh and take the C-Bomb up there for a bit of bike-on-hill action. There are several other tasty climbs, including one beast of a ramp up to Speech House. I enjoyed it and a 68″ was just about right, apart from one or two slightly tall ramps where I had to honk it a little bit. The run into Gloucester and Cheltenham was rapid and terminally dull, apart from a nice stretch around the lanes somewhere. I have been using the ‘breadcrumb’ mapping capacity on an old Garmin 500. It’s really simple; you map the route on bikehike or similar then upload it. As long as you keep an eye out for turns it works perfectly. My arrival was heralded by a chocolate cloud cake. It was amazing. The chocolate cloud cake baked by Belle of Bristol. Amazing; light, perfectly formed and subtle; the C-Bomb of cakes. The following day I rode back from Cheltenham to Bristol along my normal route; straight up and over the Cotswolds. It was cold and beautiful, but also horribly icy. By the time I’d realised just how icy, it was too late. I came round the corner near Painswick to a perfect tableau of a car, gently rocking on its side and a static sea of surface ice. Luckily a fellow cyclist had warned me near the top of the descent of ice on the road so I’d taken things extremely carefully on the way down. As soon as I saw the run-off across the road i started walking. Mercifully, no-one was hurt, although moments later the Cheltenham CCC club run came rolling down the hill and went down like nine-pins. there were a couple of dicey bits and if i wasn’t doing an A to B ride I would have turned round and headed for home. As it was, I took it steady and stuck to the main roads wherever possible. I made it back in one piece. I had a vaguely self-satisfied feeling that comes from ratcheting up the miles over the festive period. I managed a few decent rides. However, everyone else has been out doing a passable impression of team sky, busting out back-to-back 100 milers and other insane feats, including 21,000 feet of climbing in 2 days. (J’accuse Ben Davis et aussi Tom Ilett). Oh well, no prizes for having a shedload of form in February. Unless your target for the season is the Frome and District Wheelers 10 Mile Open Time Trial. Which it isn’t. I think your rule 2: ride when you can is what can make cycling and family life relatively compatible. Cycling when an acceptable window appears and not at a specified time which might coincide with a baby melt-down! All true. Longer routes to work tend to be more family compatible than heading out for dedicated rides too. That and getting up in the middle of the night to ride and be home in time for the family day to start. Rule 5 : In a few years time learn to go on rides that are 4mph average max. But they’ll be amazingly fun because you’re in awe that your kids are actually riding bikes alongside you. A wonderful feeling. It’s ONE L AND TWO T’s! i’ll get the engraving changed. and maybe the typo.